In 2011, Top Secret Writers reported on the disturbing and mysterious death of John Wheeler, his DoD work, and his connections to the Mitre organization. On February 28th, 2018, the FBI released a file on John Wheeler. This was an exciting development, considering that it’s been almost a decade since Wheeler’s body was discovered at the Cherry Island Landfill in Delaware. The circumstances surrounding Wheeler’s death were surreal and disturbing. In the days and hours before his body was discovered, he had been traveling on business. Witnesses reported that he wasn’t feeling well, and that he seemed to be in a “confused state” and not acting normally. 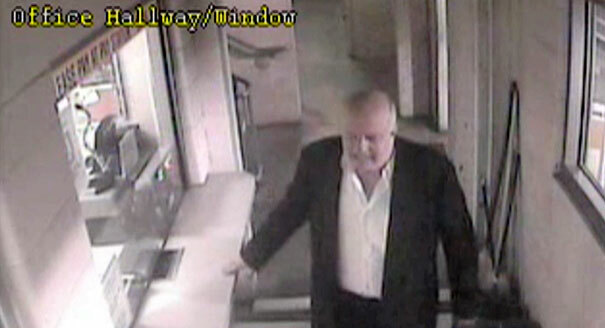 In a late night surveillance camera snapshot, Wheeler could be seen talking to a parking lot attendant after wandering aimlessly around the parking lot, carrying one damaged shoe in his hand. We reported on all of the unusual circumstances and clues surrounding John Wheeler’s death as well. If you’re suspecting that the FBI files reveal the results of a massive Federal investigation into the murder of a U.S. goverment official, think again. The FBI appears to have given up on their duties in the case of the Wheeler murder. Instead, the released FBI files detail the controversy in 1983-1984 when Washington DC Channel 9 reporter Carlton Sherwood accused the Vietnam Veterans Memorial Fund (VVMF) of mismanaging funds. 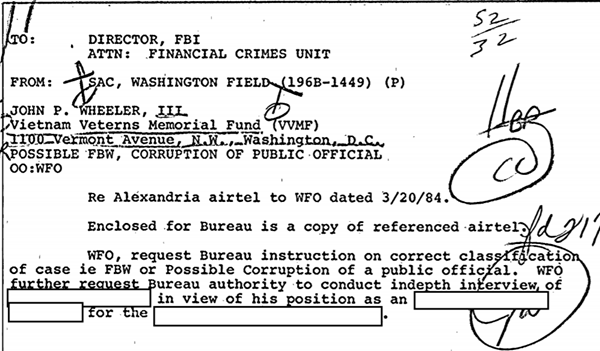 He even reported Wheeler, as the founder of the fund, to the FBI as a core part of the “scheme”. The rest of the 106 page Wheeler FBI file is a repeat of the same information, news reports revealing that Wheeler had reported Sherwood for illegaly recording a conversation, and a final report from the GAO clearing the VVMF of any wrongdoing. Not long after this fiasco, Sherwood left Channel 9 news as a reporter. It’s very difficult, if not impossible, to correlate any of the information in the released FBI files to Wheeler’s death. The only scenario that might make sense is that Wheeler and Sherwood developed a lifelong grudge against one another for the wrongs that were inflicted, and one eventually managed to get the other one killed. However, Sherwood (and Wheeler) were both well-decorated war veterans. In fact Sherwood was a recipient of the Pulitzer Prize and the George Foster Peabody Award for his work in journalism. These are not individuals likely to arrange the murder of anyone. So we are once again left with a dead end as to who actually killed John Wheeler back in 2011. But there is one intriguing, lingering clue that comes out of this release. It appears that at his last days, both Wheeler and Sherwood were interested in the same life pursuit — fighting domestic terrorism. It’s fascinating that a life-long journalist would end his career in the field of antiterrorism. But what’s even more compelling is the small clue we reported on in 2011 immediately after Wheeler’s death. During those years, Wheeler had been consulting with Mitre. Had two lifelong enemies become colleagues in the war against terrorism? Or were the two in the middle of a lifelong battle against one enother — even competing in this new field as well? Or…is there no connection between these two men and Wheeler’s death at all? One thing is for certain — Wheeler’s murderer(s) remain far from the jail cell they belong in, and the Feds seem far from interested in seeking justice. Instead, they’re releasing ancient history and doing nothing at all to bring the murderers to justice.